Did you know people with diabetes are two to four times more likely to have heart disease? Did you know they are also two to four times more likely to have a stroke? Did you know genetics and environmental factors such as obesity and lack of exercise appear to play roles in the development of diabetes? Did you know women who have had gestational diabetes are at an increased risk for developing Type 2 diabetes later in life? Did you know people with Type 2 diabetes often times display no symptoms? Did you know the risk of developing Type 1 diabetes as a child is higher than virtually all other severe chronic childhood diseases? 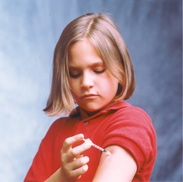 Did you know peak incidence of Type 1 diabetes occurs during puberty? Did you know the symptoms for Type 1 diabetes in children can mimic the flu? Did you know that men over the age of 50 with diabetes have impotence rates as high as 50-60%?